This satisfying Tex-Mex Benedict recipe will up your poached egg game with skirt steak, cheddar biscuit dough and plenty of spice. TABASCO® brand Green Jalapeño Pepper Sauce --- 2 Tbsp. Hollandaise sauce, warm --- 1 qt. Cheddar biscuits --- 12 ea. Butter, melted --- 2 Tbsp. Poached eggs --- 12 ea. Combine 1/2 cup TABASCO® Original Red Sauce, with pico de gallo; set aside. 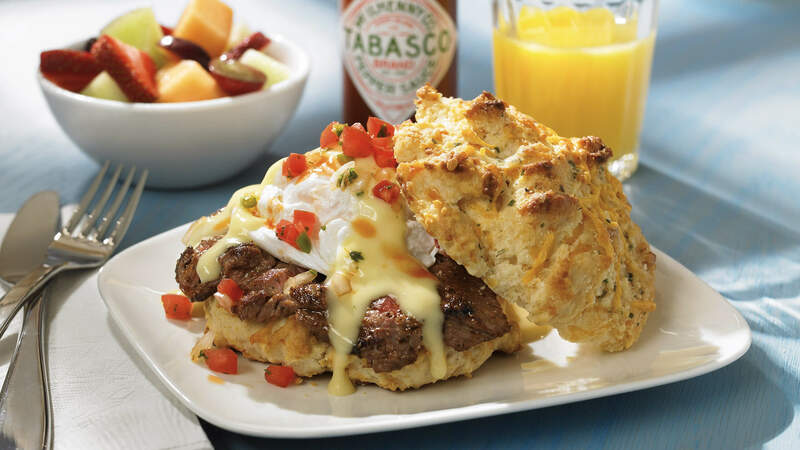 Combine remaining 1/2 cup TABASCO® Original Red Sauce, with hollandaise sauce; keep warm. Lay out uncooked biscuits, brush on melted butter and TABASCO® Green Jalapeño Sauce; cook biscuits according to instructions. Cut baked biscuits in half; place 4 oz. sliced steak on the bottom of each biscuit. Lay 1 poached egg over steak, spoon hollandaise over steak and spoon equal amounts of pico de gallo over that. Lay the top of the biscuit on the side of the stack.